An Andromada in flight in GTA San Andreas. The Andromada is an airplane in Grand Theft Auto: San Andreas. The Andromada is a large 4-engine transport airplane based on the Lockheed C-141 Starlifter. Its name is a misspelling of "Andromeda", a mythological Greek princess, a galaxy, and constellation. If the Andromada is obtained, the player can fly it as if it were a normal plane, with controls and handling similar to the AT-400. The plane is not fully textured, and as such the cockpit windows are dark. The plane can support a combination of two body colors: One for the fuselage, and the other for the wings, engines, vertical stabilizer and elevators. The plane's rear cargo door can be also opened and closed, but nothing can be stored in the plane itself; neither can the player enter the rear is impossible due to an invisible wall. There are, however, mods available to create a fully functional cargo area. The interior of the Andromada is seen in the mission "Stowaway", however, like the interior of the Shamal in Freefall, this interior is not part of the plane model. It is in the "interior universe" (where all game interiors in San Andreas are situated), high above the sky, with clouds moving outside to simulate the plane itself moving. Parts of the exterior of the plane are visible when standing at the edge of the ramp. The interior is only enterable via that mission, cheats, or a trainer. Within the interior are two 2 cargo areas walled off by netting, followed by cargo boxes, then shelves stocked with barrels. A wrecked Andromada in Grand Theft Auto: San Andreas. An Andromada seen flying over Ganton, Los Santos. 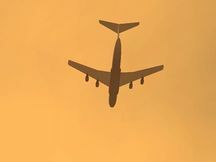 The plane is featured in the mission "Stowaway", where Carl Johnson rides a PCJ-600 into the back of the plane as it takes off from Verdant Meadows, blows it up, and then parachutes out. This version of the Andromada is bigger than the one that can be spawned in-game, and has a much wider cargo bay. Another Andromada is briefly seen again in the mission "A Home in the Hills" as CJ is on his way to Madd Dogg's mansion; there is a shot of the Andromada flying over the The Camel's Toe Casino out of Las Venturas, heading south to Los Santos. Like the AT-400, Andromadas are seen flying over cities; however, they fly much faster than AT-400s. The Andromada is not intended to be obtainable by the player, as there is no animation for opening the door of the plane upon entry. However, it can be stolen during "Stowaway" with a trick that involves blowing up the plane and pushing it into the Verdant Meadows hangar, but it is difficult to exploit as the plane may disappear. Otherwise, the Andromada can also be obtained by way of a third-party trainer program. The Andromada shares its name with the real life Andromeda galaxy (with a slightly different spelling), this is probably a reference to the plane's size. This page was last modified on 3 February 2013, at 20:53.